PLEASE NOTE THAT THE DATES GIVEN ARE GIVEN BY CORGI TO US AND WE CANNOT BE HELD RESPONSIBLE IF THESE DATES ARE NOT KEPT TO. To mark the 50th Anniversary of the formation of the Royal Regiment of Fusiliers, and working with the Go-Ahead Bus Group, a special commemorative livery has been applied to two of the company’s Wright buses; one based in Newcastle and one in London. 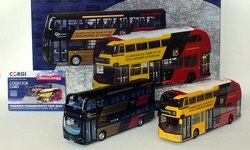 Corgi Original Omnibus is proud to be working with the Fusiliers to produce this special edition Go-Ahead Group Wright Bus twin pack in the ‘Fusilier50’ livery complete with premium presentation box.